If you liked Iraq, you're going to love Iran. Remember how the war in Iraq was going to "begin a new stage for Middle Eastern peace" by "bringing hope and progress into the lives of millions"? Those were the words George W. Bush used to sell the war during a speech to the American Enterprise Institute in February 2003. Well, those, and a few more about how Saddam Hussein was "building and hiding weapons that could enable him to dominate the Middle East and intimidate the civilized world." Those weapons were never found, of course. As for the transforming-the-Middle East stuff? Here's where we stand today: Iraq is such a mess that even an ardent war supporter says it's time to start getting out. 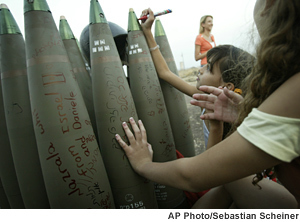 Israel, Hezbollah and Hamas are at war; several hundred people are dead, yet Hezbollah is still vowing to "humiliate" Israel, and -- as shown in the photograph above -- Israeli girls are still writing messages on shells destined for southern Lebanon. Beirut is under siege. U.S. troops are under attack from Taliban forces in southern Afghanistan. The president is warning that Syria is trying to reassert control over Lebanon. Iran is hoping -- successfully, so far -- that the fighting between Hezbollah and Israel will distract attention from its nuclear plans. And now Turkey is signaling that it's ready to send troops into Iraq to fight Turkish Kurdish guerrillas there. They've got a director of lessons learned over at the White House, so maybe it's fair to ask: Is our children learning? Let's go back to the American Enterprise Institute. Danielle Pletka, AEI's vice president for foreign and defense policy studies, tells the Washington Post that she doesn't know anyone who is "not beside themselves with fury at the administration" just now. The right's complaint? As the Post says, "Conservatives complain that the United States is hunkered down in Iraq without enough troops or a strategy to crush the insurgency. They see autocrats in Egypt and Russia cracking down on dissenters with scant comment from Washington, North Korea firing missiles without consequence, and Iran playing for time to develop nuclear weapons while the Bush administration engages in fruitless diplomacy with European allies. They believe that a perception that the administration is weak and without options is emboldening Syria and Iran and the Hezbollah radicals they help sponsor in Lebanon." Well, right. And why is that? Why are Iran and North Korea able to do what they want with little fear of serious repercussions? Why might Syria and Iran and Hezbollah think the administration is weak and without options for stopping them? It gets back to the beginning of all of that, the part about those U.S. troops "hunkered down" in Iraq. They're there, of course, because Bush sent them there -- and because people at places like the American Enterprise Institute applauded so enthusiastically when he told them what they'd been telling him: Invade Iraq, and we'll transform the Middle East. Invade Iraq, and we'll make the world a safer place. Are they chastened by the experience? Wiser for the knowledge that the deaths of 2,544 Americans and more than 50,000 Iraqis have bought? It doesn't look that way. This morning on Fox News, neocon pundit Bill Kristol said that the United States has to be ready to use military force against Iran. "Think what this crisis would be like given what we now know about the Islamic Republic of Iran, its regime, its recklessness, its close, close ties to terrorist groups," Kristol said. "Think what the world would be like with an Iran with nuclear weapons." It sounded like satire, only Kristol was dead serious -- even as he delivered the greeted-as-liberators punch line: The Iranian people "dislike their regime," he said, and they might just welcome "the right use of targeted military force."